The first bill I introduced in the Senate was to slash the interest rate on federal student loans to the same deal the big banks got. For years, I’ve been pushing ways to roll back student loan debt because students don't have an army of lobbyists & lawyers. Student loan debt was the first fight I picked when I got to the Senate – because if we drown our students in debt, we drown this country’s future. 🔬 We believe in science. 🏝 We know the climate crisis is happening. 🚫 We aren’t doing enough to #ActOnClimate. It's time for big, bold action. It's time for a #GreenNewDeal. Space Force won’t increase our competitive advantage in space, or make America any safer. It’s just another layer of military bureaucracy that we’ll have to pour buckets of money into. I think taxpayers deserve better. When disaster strikes, everyone should get the help they need. But the evidence shows this isn’t always the case. 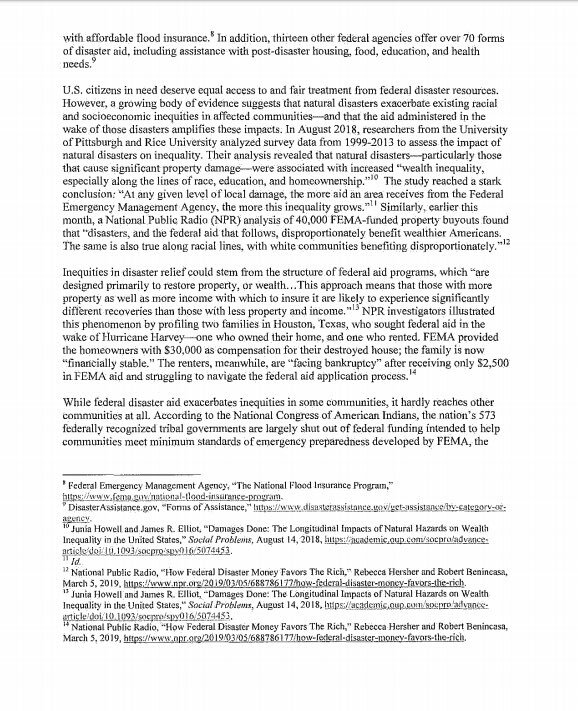 @BennieGThompson & I want @USGAO to review how disaster aid programs may worsen inequality in our country so we can do something about it. Someone was murdered at a Neo-Nazi rally today. That happened. In America. In 2017. It's time to make clear where we stand – all of us. The definition of "poor leadership" is sitting at your golf club while millions of US citizens beg for your help, @realDonaldTrump. We need a real, independent prosecutor who @realDonaldTrump can't fire, Sessions can't intimidate, & Congress can't muzzle. We need it now. This isn’t over. Thousands of kids have been ripped from their parents with no plan to reunite them. And now wants to create new detention camps for families. Separating kids is unacceptable – but indefinite imprisonment of families is still cruel & inhumane. Let me repeat: the @POTUS fired the nation’s top law enforcement officer for refusing to defend an illegal, unconstitutional, immoral order. ❌This wasn't a full or fair investigation. ❌ It doesn't exonerate him. ❌ The available documents contradict what he said under oath.